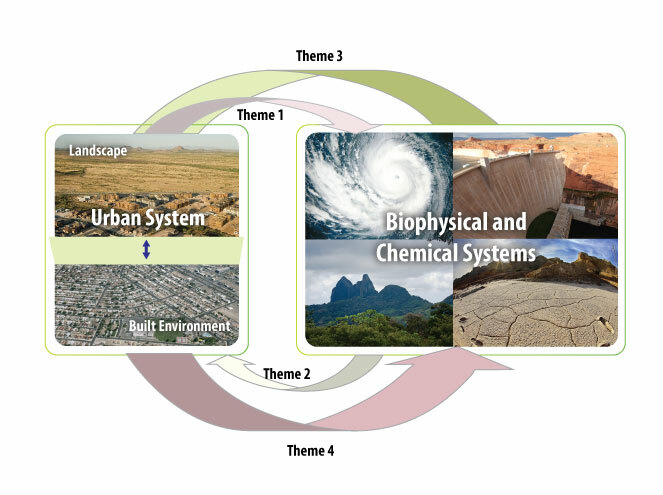 The framework started with processes within the urban system that contribute to global environmental change (Theme 1). Theme 2 focused on the pathways through which specific global environmental changes affect urban systems. Once these pathways and points of interaction were identified, the framework addressed the resulting interactions and responses within the urban system (Theme 3). Theme 4 centered on the consequences of the interactions within the urban system on global environmental change, or feedback processes. Source: Sanchez-Rodriguez et al., 2005. Communicate information to policy makers and the public. How do lifestyles and consumption patterns within urban areas contribute to global environmental change? How does urban land use and land cover change affect global environmental change? What are the zones of influence of urban systems, and how do these social and biophysical ‘teleconnections’ affect global environmental change? What are the main processes by which global environmental change affects human behavior and interactions? How does global environmental change contribute to shaping the built environment? How does global environmental change affect the resource base upon which urban systems rely? How do interactions between human and physical systems shape the impact of global environmental change? How do the interactions between the human and physical systems shape the responses to global environmental change? How do the impacts of global environmental change affect the livelihoods of urban communities? How do the results of interactions within the urban system modify the impacts on various components of global environmental change?